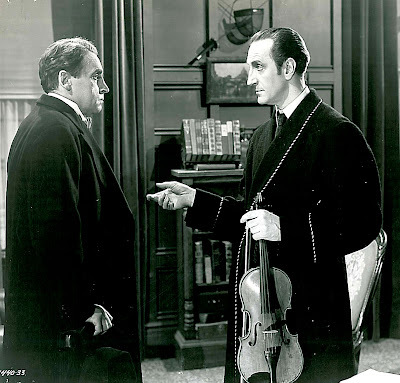 Critical standards be hanged whenever I address Basil Rathbone’s Sherlock Holmes series. Currently engaged in re-viewing all fourteen, I must confess to being all for each and more so for all, as there’s not, for me, an outright dud in the lot. Most of you have taken these up, I’m sure. Who hasn’t that grew up with a television in the house? Maybe not for a while, though. TCM ran a batch for Christmas, finally licensing ones that aren’t PD. If you’ve not visited the series lately, go back and look again, because they hold up beautifully. The scary ones are more so than whatever monster shows Universal was doing at the time (did any Shock Theatres run The Scarlet Claw? If not, they should have). Here’s the thing with me and Sherlock, or maybe I should say Rathbone and me. I wanted to be this man. No, forget the past tense, I still do. He is devastatingly cool. Others have said he is snippy and arrogant with Dr. Watson. That never bothered me. 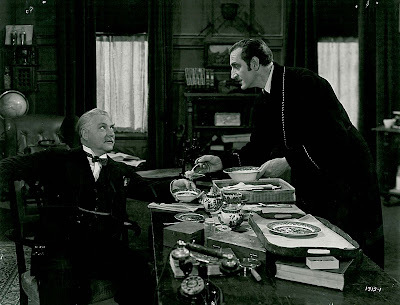 Maybe because I knew Basil and Nigel Bruce were on-set pals and cooked up much of the repartee themselves. Sherlock Holmes was always easier going for this viewer than Charlie Chan. I didn’t have to follow narratives so closely with SH. Chan would invariably lose me with so many red herrings and complications. Maybe I'm confessing to plain stupidity, but mysteries go down better here when they're not so mysterious. With Holmes and Watson, the goal line was visible and it was usually a matter of tracking opponents we know and understand right from get-go. Revolving door suspects seldom cluttered their way. These two often as not spent half-a-dozen reels tracking simple quarry, be it a match folder, music boxes, or busts of Napoleon. Why they did so provided the bumps and saw us through narratives straightforward and always ripe for revisiting. Villainy was more colorful for not having to wait an hour to find who villains were. 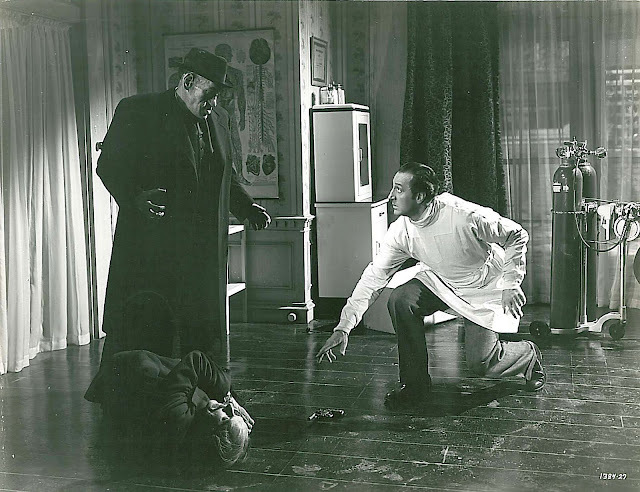 To observe commonplace Holmes rituals is as enjoyable as seeing him bust up crime. My pleasure's complete for Rathbone exclaiming Kippers! over his serving tray. I’ve promised myself for years to fix up a room just like 221 B Baker Street. Lots of devotees surely have. What am I waiting for? 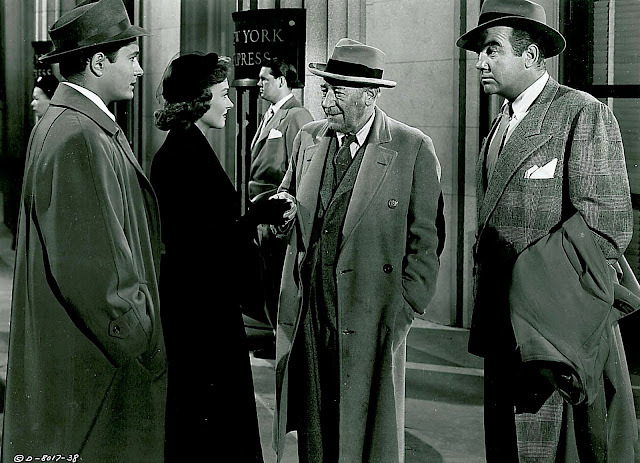 Director of most Holmes entries Roy William Neill was under-appreciated then and more so now. He said it was atmosphere that made these pictures work, and so laid that on with a trowel. Script deficiencies matter less with Holmes than elsewhere. A dark house was never darker than ones Neill managed. I’ll bet he kept a fog machine running in his den at home. 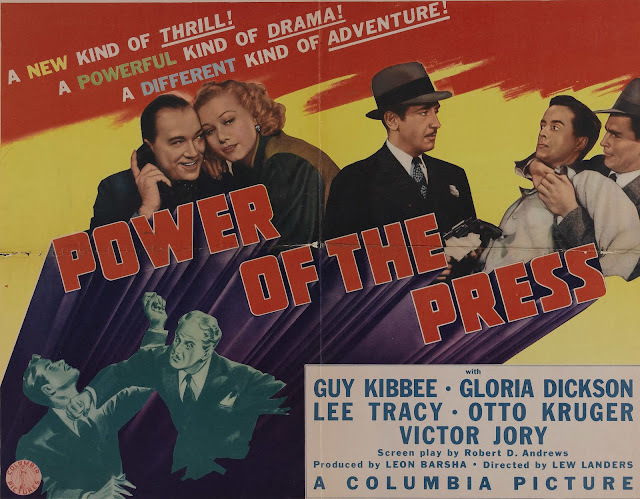 Had this director not passed so early (1946), there’d have been a second wind sure doing film noir, this suggested by promise of his last, Black Angel. Several of the Holmes stop short of being horror films, but only just. They frankly make better use of familiar icons than straight-up chillers did. Lionel Atwill, George Zucco, Henry Daniell, and certainly Rathbone seldom had better dialogue or such fruitful situations as were provided by these. You could depend on a Universal Holmes to position its opponents head to head for verbal showdowns always the highlight of respective shows. 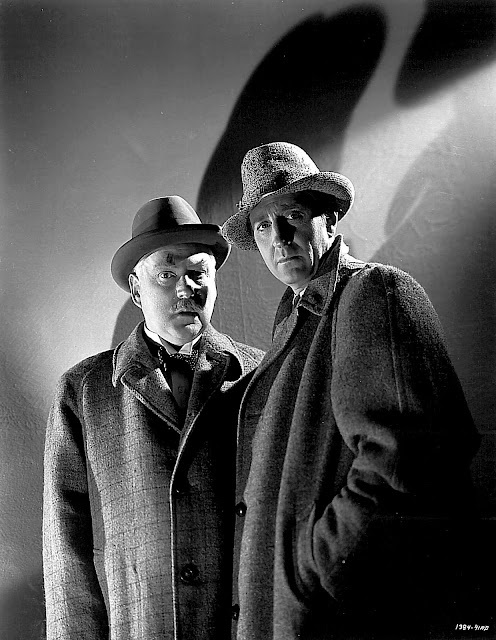 I’d guess for players of Rathbone and Atwill’s experience, a last reel parry in Sherlock Holmes and The Secret Weapon would be a child’s walk-through, but to contempo eyes, being so long deprived of classically trained thesps, they seem positively brilliant. I was never bothered by updates to wartime setting for Holmes at Universal. Impure as this was in the face of Conan Doyle, it did lend urgency to detecting that might seem prosaic against gaslit backgrounds. For at least a first brace of Universals, the very Empire itself was habitually at stake, and that couldn’t help but increase excitement for uncertain WWII audiences. Sherlock Holmes made a credible adversary for Axis powers, more so perhaps than Superman or Tarzan, and Universal’s 40’s London seems hardly removed from Doyle’s own conception. The Universal Holmes group was customized for supporting positions. You’d generally find them beneath an Abbott and Costello or Montez/Hall. Those latter were the big noise on selling ends for a company struggling to break into first-run theatres with their attendant heady revenues. 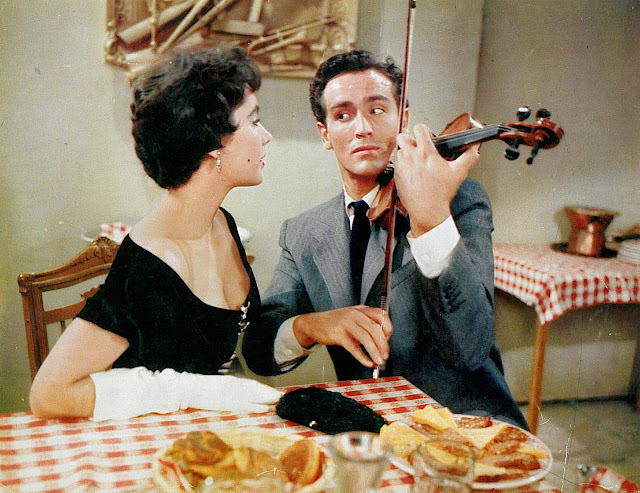 Holmes was generally dessert served after a main course of action, music, or comedy. Sometimes he even backed up stage shows, as here. Running times and negative costs made clear these were B’s for supporting position. A Sherlock Holmes seldom ventured far past an hour, ideal length for us now, as there’s never padding evident. Money that Universal spent clearly tabbed the series for lower-berths. 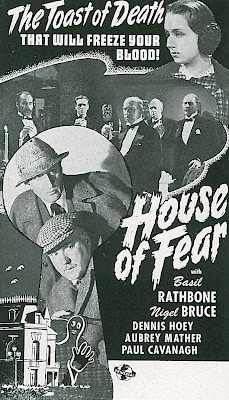 Sherlock Holmes and The Voice Of Terror was first of the group (released September 1942) and cost $131,000. Expense crept up as further entries surfaced. 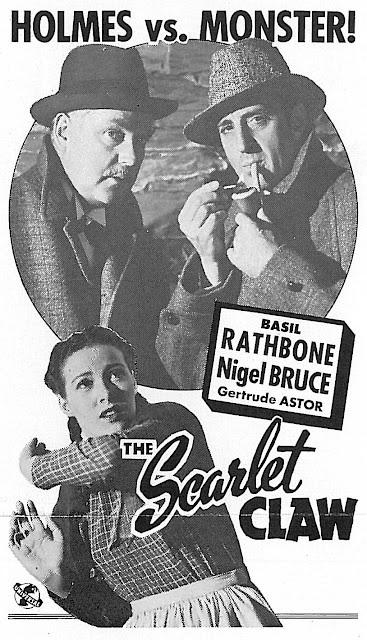 The fourth, Sherlock Holmes Faces Death, ran to $168,000 in negative costs, while The Scarlet Claw (May 1944) took $203,000 to finish. Even as the company’s purse strings held fast below "A" level, final product never reflected it. These were some of the most handsome program pictures around. 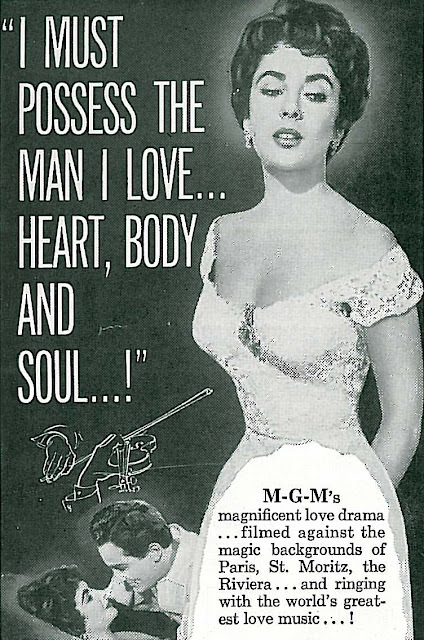 Universal sold their Holmes group outright in 1954, first to James Mulvey, president of Samuel Goldwyn Productions, who in turn peddled them to Motion Pictures For Television, headed by Matty Fox. That year found Holmes all over home screens and stirring up resentment among exhibitors who kept score of studio backlog gone free tube routes. 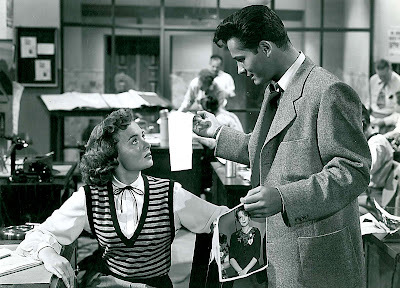 TV distributors sliced off logos and end title references to the original producer (as means of minimizing awareness that a major company was bargaining with television), but trade watchdogs like Harrison’s Reports were not fooled. Pete Harrison got what he called the no comment treatment upon inquiry to Universal executives, and warned that theatre owners probably will not soon forget those companies who are selling old pictures to a medium that offers free entertainment in direct competition with them. Some of the negatives got lost among varied handlers passing them one to the other. 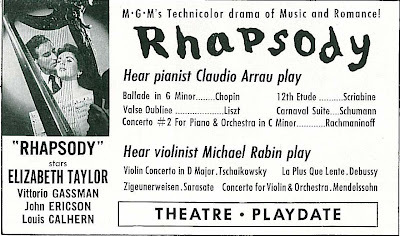 Matty Fox ultimately sold the Holmes package to Eliot Hyman’s Associated Artists Productions, and AAP put several back into theatres, even as they continued playing free-vee. 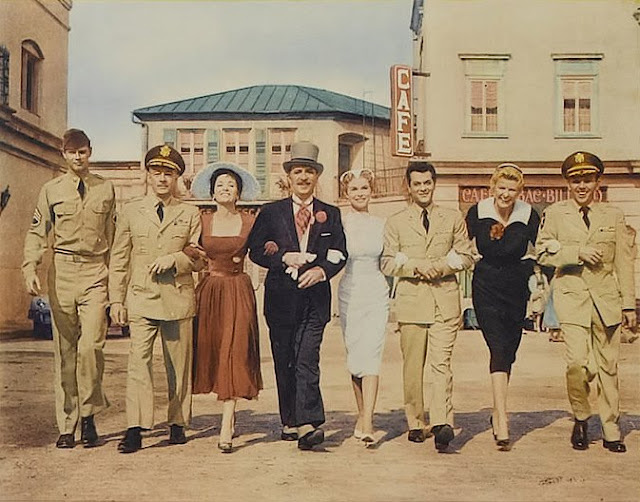 United Artists took over Holmes from AAP by the late fifties, with Four Star International succeeding them in May of 1965. The seventies found Leo Gutman, Inc. distributing the twelve. For all this handling and exchange of existing elements, it’s a wonder the Sherlock Holmes films survive at all. Thanks to multiple cooks in the stew, prints were easier got by collectors trolling among TV outlets just done with broadcast rights. I scored the twelve from a Greensboro station happy to get rid of burdens on their storage space. My willingness to carry this stuff off merely saved them a trip to the dumpster. 16mm Holmes prints were generally good. It was lousy dupes made off four having gone public domain that gave black eyes to the rest. One I remember as problematic, even in so-called "original" prints for television, was The Spider Woman, so far removed from its camera neg as to be almost unwatchable (fortunately, the DVD rectifies that problem). The two Fox features, Hound Of The Baskervilles and Adventures Of Sherlock Holmes, were for years isolated from the rest and difficult to track down. 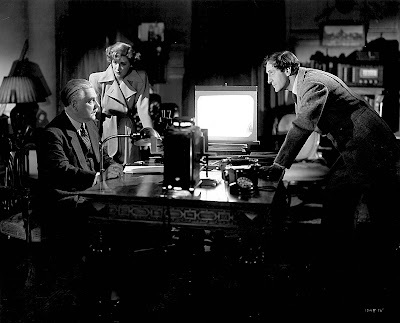 Baskervilles had been sold to TV during the early fifties and appeared in syndication under the Hygo Television Films banner, and by 1959 turned up in a large Screen Gems package with 228 other titles, including Fox’s Charlie Chans. Hound Of The Baskervilles was later withdrawn from syndication over rights issues and remained in limbo for some time. The other Fox property, Adventures Of Sherlock Holmes, initially played TV via Matty Fox’s Motion Pictures For Television during the mid-fifties, then was back among 20th packaging with others of their pre-48’s. It was quite the event when CBS rescued Hound Of The Baskervilles and Adventures Of Sherlock Holmes from obscurity for late-night network runs around 1979-80. 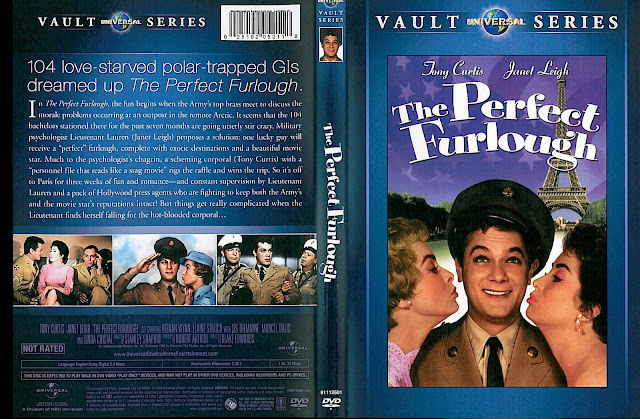 Now the Universal twelve, plus the Fox pair, are neatly packaged on DVD after having been restored by UCLA’s film archive, funds for that provided in part by Hugh Hefner, one of classic film’s most generous benefactors. I once looked at Hell and High Water with a film studies professor who said little until a scene where a guy’s thumb got mutilated in a submarine hatch. Ah yes, Sam Fuller, he laughed appreciatively as the character writhed in agony. 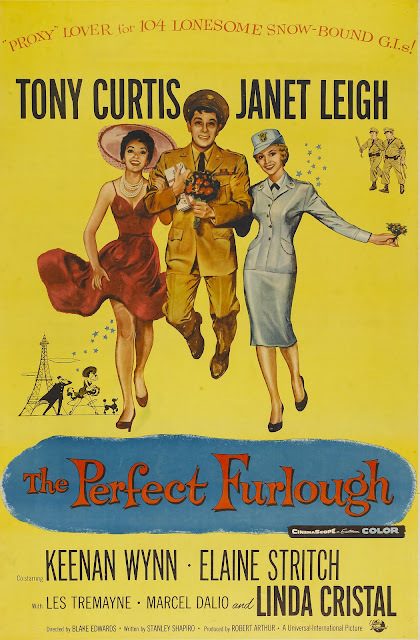 Of all directors bearing maverick label, Fuller may be easiest to venerate. He painted with the broadest brush, always had a big cigar in his mouth, and came of hardscrabble background that made his narrative calls unimpeachable among buffs who never saw combat or insides of city rooms like he did. Sam also lived long enough to mentor a lot of them. He’s the kind of flamboyant auteur I’d like to have sat down with, being among few that really fit definition of that overused tag (he did it all upon assuming control of sets). Columbia’s recent seven-disc Samuel Fuller Collection gives voice to industry successors who sat at the Great Man’s knee and learned at least as much about life as wild and wooly films he yanked out of cauldrons filled with strife and attempted studio interference. Here was the tough guy artist every beginner wanted to be when he grew up (and I limit that to he for suspecting that women don't find Fuller’s work so appealing). Surely SF knew galvanizing effect he had on New Hollywood acolytes. They tell of finding him night and day bent over a typewriter, knocking out scripts and articles like tabloid pieces he generated daily during gangland twenties. I wonder if his wife and daughter aren’t still finding stories tucked away in Fuller closets and drawers. 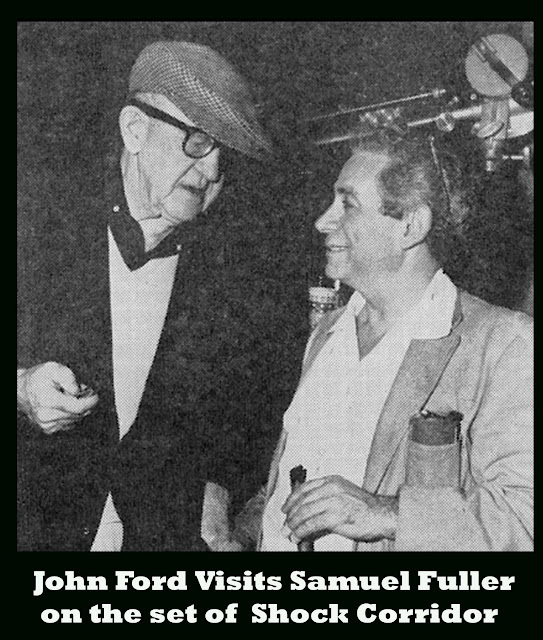 The Columbia set introduced me to several B’s Samuel Fuller penned on his way to becoming a full service writer/producer/director. Others mostly took screenplay credit, but concepts and ideas seem to have largely originated with Sam. The nice thing about the DVD box is dual usefulness as Fuller instructional plus first acquaintance for many with Columbia B output from the 30’s/40’s. Other than some horror films and one or two westerns John Wayne happened to appear in, we’ve had nothing by way of low-budget disc representation from this company. 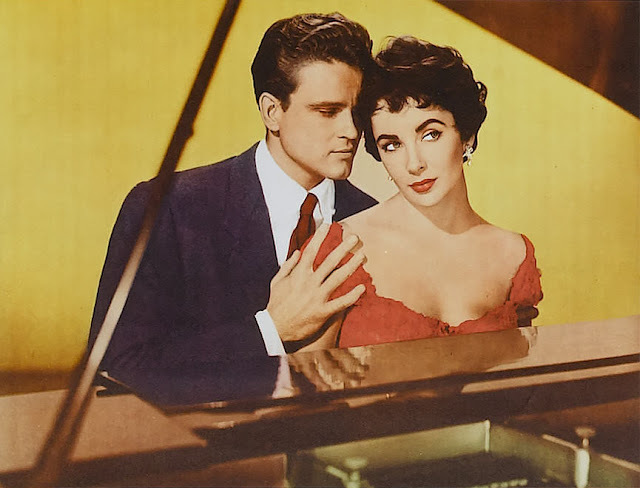 An inside Hollywood story with Richard Dix and Fay Wray would be welcome in my household even if Sam Fuller had nothing to do with it. The fact he wrote It Happened In Hollywood with three other scribes is sole basis for inclusion here, but whatever gets DVD release done is Jake by me. Same for The Power Of The Press, a six reel quick-shot I particularly enjoyed seeing guest celeb Tim Robbins gush over as though it were opening shot of a coming social Revolution. Fancier writers than me (and I hope it stays that way) call Fuller an authentic American primitive and/or a didactic patriot. That’s how big a net this man throws. Mostly though, he was a yarn spinner always stacks ahead of whatever one he’d just finished shooting. Six Fuller clones might have kept up with adapting to movies all the stories he developed. There was a trade announcement in 1964 wherein Sam touted a forthcoming comic team of Constance Towers and Patsy Kelly, the two just off The Naked Kiss. 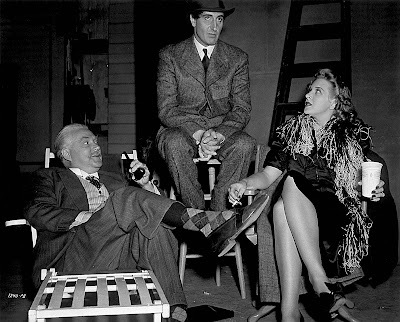 They’d get laughs, he promised, just like Kelly had done with Thelma Todd back in 30’s comedies the director remembered fondly. That notion came to merciful naught, but who knows? --- Fuller might have made something wonderful of it. Disc extra disciples say he used to generate narratives in a standing position based on half a sentence one of them would get out, the whole thing ready for a binder minutes later. This writer/director’s enthusiasm for the craft was such as to nearly implode his fertile brain. Fuller’s kind of prolificacy wouldn’t let him sleep. Such overabundance of talent must have seemed at times more curse than blessing. A novel of Sam’s that broke through was The Dark Page, well named for exploring newspapers and crimes they exploited. 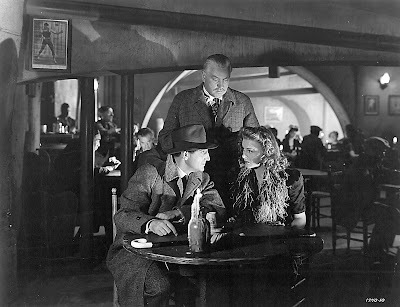 Howard Hawks bought it not long after 1944 publication and that promised an important screen translation. 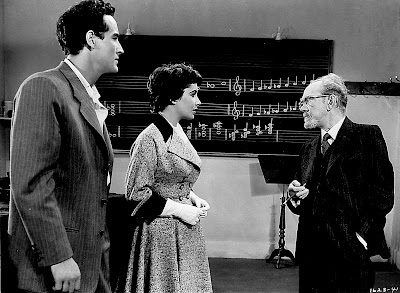 How it ended up at Columbia’s discount store is a tale insiders could better tell, but I wonder if 1948’s The Big Clock stole a little of its thunder for a very similar premise. 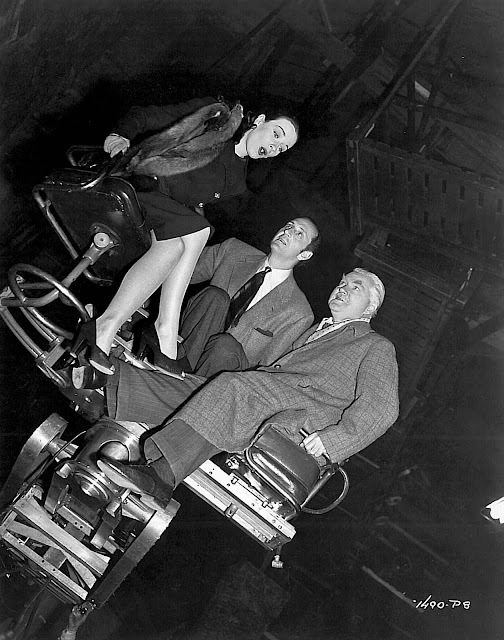 Fuller didn’t get to direct the movie as emerged in 1952. That was done, and well, by Phil Karlson. 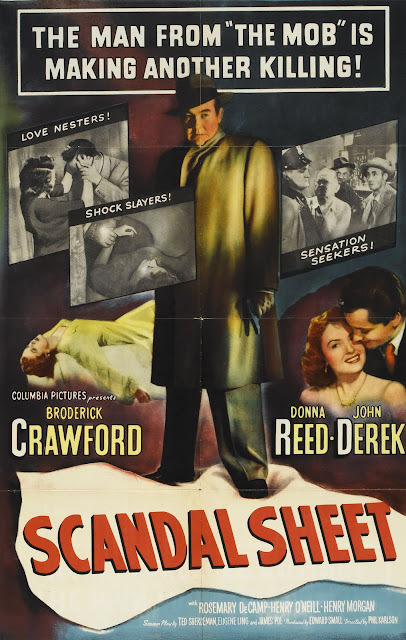 Scandal Sheet was a title deemed better suited to lower berths it mostly occupied (domestic rentals a mere $581,000). Columbia shoveled economy bookings full with what they had for stars. 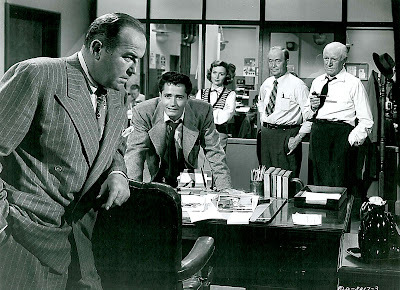 Lead Broderick Crawford had fluked an Academy Award a couple years before, but what else would go on sustaining him other than big bruiser roles like he played before Willie Stark? TCM reminded us lately of how good some of those are (seen The Mob?). 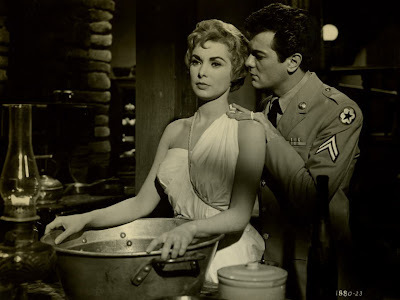 John Derek was like Tony Curtis minus intensive training Universal-International would have accorded him, while Donna Reed worked ways toward her own fluke of an Oscar for From Here To Eternity the following year. Scandal Sheet is very much a writer’s movie, which makes it a Samuel Fuller movie even if someone else called Action and Cut (and they say this very good show is considerably denuded from the book). For what he had to offer (and so much of it), I wonder why Columbia didn’t just hire Fuller to do three or four per annum, on his own efficient terms. He was known for coming in under schedule and budget, after all. Given opportunity, SK could have turned out films with the frequency of bulldog editions he’d sold on streets as a boy. Buried and obscure Fuller films continue to surface. Park Row turned up on TCM. Three of his for Lippert have been released. Even incendiary White Dog barks again on Criterion's label. I haven’t watched that for being less often of an incendiary frame of mind and knowing what trauma cut-loose Fullers can inflict. His work scores best, I think, with youth in quest of shock and awe. The Naked Kiss and Shock Corridor are two ideally suited for them and others girded for a pummeling (Fuller college retrospects were always reliable programming). Of the seven Columbia packaged, Underworld USA deals the harshest dose of Fuller per expectation interviews and profiles create. Watch it and know his is a sensibility utterly unlike anyone else’s in movies. How special was Cinerama to 50’s audiences? I’d guess it ranked below Disneyland, but higher than a circus or the Ice Capades. It was less about going to the movies than seeing an indoor natural phenomenon. People dressed up for Cinerama and recognized presentations for something truly special. There’s an IMAX theatre at Myrtle Beach, SC and we’ve been a few times. I could wish folks regarded that a bigger deal, but patronage wearing flip-flops don’t seem overwhelmed. Does IMAX surpass Cinerama? What I’ve seen looks impressive, but three-strip excerpts and photos of all-engulfing screens make me long for the old process. 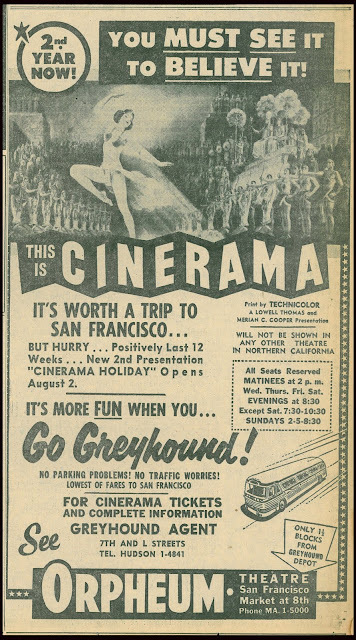 I keep running into ads for Cinerama in big city newspapers turned yellow. Shows played two or more years then. 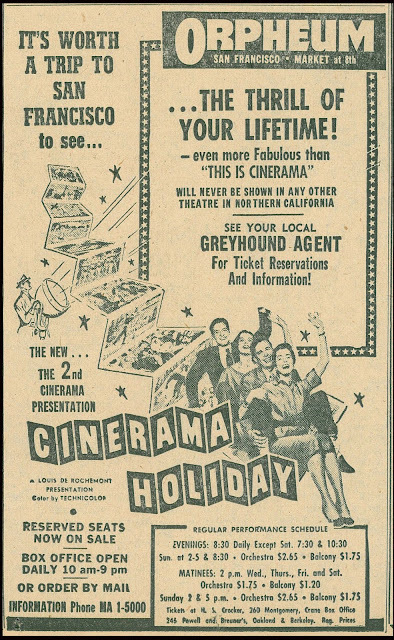 California hosted Cinerama in Los Angeles and San Francisco. Ads for three-strip attractions were published in adjacent cities as the process was deemed worth driving to see. Frisco's Orpheum tied in with Greyhound and lured customers in Sacramento to bus ride the 86 miles in something very much like the 1955 Courier pictured below, newest of luxury highway transports. I noticed in these ads that Greyhound’s depot was only a block and a half from the Orpheum. Comfort and convenience were major selling points then. I guess people knew all too well how rugged bus travel could be. So how long would 86 miles in a Greyhound have taken in 1955? You’d have to figure your entire day for hours both ways plus the show. That’s wanting pretty badly to experience Cinerama. Orpheum ads said Will Not Be Shown In Any Other Theatre In Northern California. 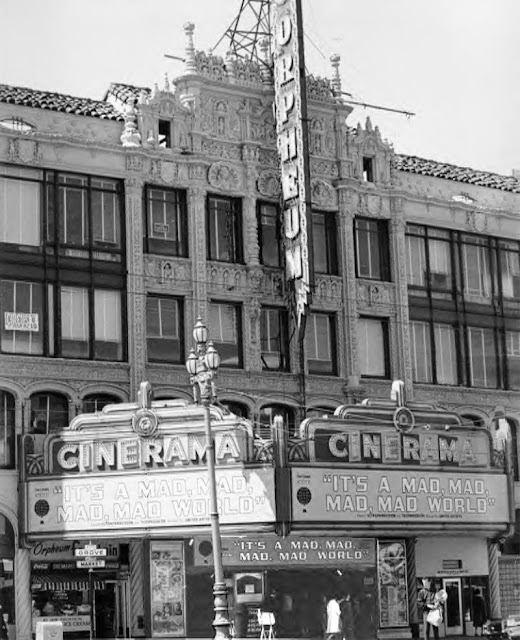 Inquiry suggests their legend stayed true at least through the 50's, as no other cities in California seem to have gotten Cinerama until San Diego later on, then finally Sacramento in 1963. The ads promised it was More Fun When You Go Greyhound. My family drove up the California coast in 1962 and that was no picnic, ours being a station wagon with four kids, two beleaguered parents, and no air-conditioning. A bathroom stop I needed could not be gratified on LA freeways the likes of which we’d never encountered on NC byways, so a paper cup ended up having to do (it didn’t). So how does any eight year old properly handle a situation like that? 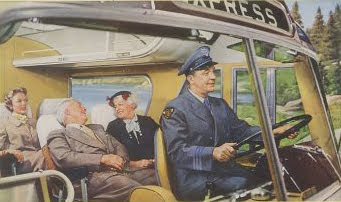 I’m picturing accommodations on a Greyhound bus seven years earlier. Traveling that way always seemed the province of down-and-outers like Dana Andrews in Fallen Angel where he’s thrown off for not having fare. I’ve done a Google pass to see when buses got cooling systems. 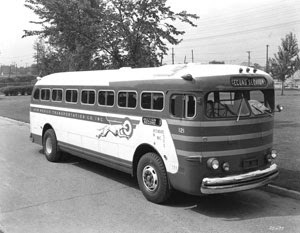 Greyhound introduced the Scenicruiser into its fleet in 1954 and these represented big strides for travel comfort. From best I’ve determined though, air-conditioning and rest rooms weren’t generally available to passengers until the company took delivery of fully equipped forty-foot coaches between 1957 and 1960. I’d guess a lot of people enjoyed bragging rights they’d acquire for having witnessed Cinerama. If nothing else, it meant you’d visited the big town, as no small burghs had three-paneled screens. My own chance to savor the process was blown during the nineties when I was too bone idle to drive a mere 416 miles to Dayton, Ohio where prints from John Harvey’s collection were being shown. That’s a miss I’ll always regret. The trades ran a startling headline in April 1959. Charlie Chaplin, turned seventy that month, was reviving the Little Tramp for a new feature, his birthday present to the world. 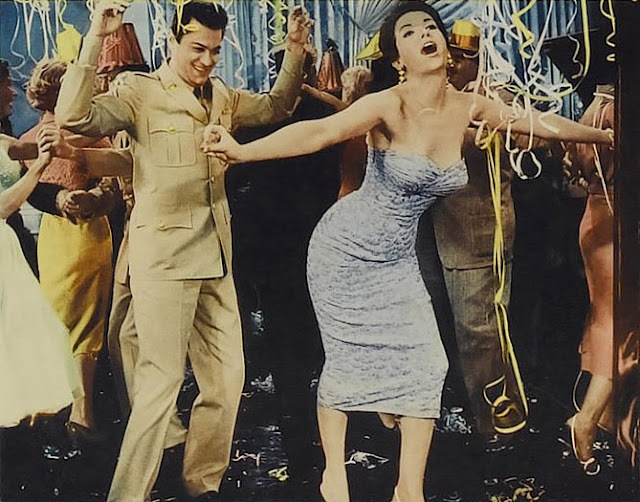 Chaplin described it as a ballet slapstick in color, complete with all the works. Cuckoo as the idea seems today, there was pathos in Charlie’s circumstance not unlike those he’d mined decades before when America loved his Tramp best of all clowns. Guess Switzerland was a lonely place, as even splendid exile was exile nonetheless. Chaplin enjoyed a world’s adulation and became fretful without it. Picking up Euro awards was scant compensation for losing a profitable US market. 1972 has been credited as the year he returned in triumph, but there were earlier (if tentative) bids, 1959 being early serious effort at re-garnering American hugs he had gone too long without. It was a busy time for CC and his lawyers in any event. Opening salvo followed close behind April's comeback bulletin. 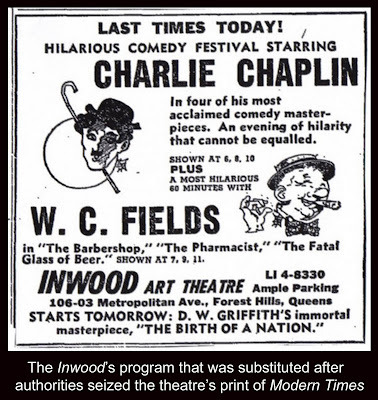 The Inwood Theatre in Forest Hills, Queens was just then running Modern Times to an often-full house. They frequently booked silents in accordance with long-standing art and oldies policy. A Washington based mouthful called International Art Production Management Company supplied the 16mm print. Court-sanctioned marshals raided the Inwood on April 14 during a Modern Times unspool with 450 patrons seated. There was nearly a fight in the booth as reels were yanked off projectors. Admissions got refunded while officers hauled off the alleged contraband. 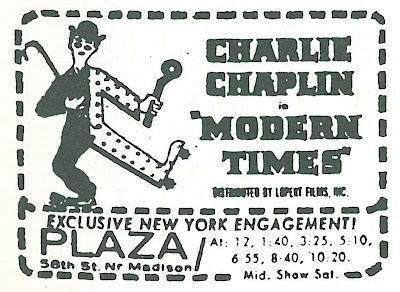 Hasty substitution found Chaplin shorts and a W.C. Fields group as following day attraction while court action filed by the Roy Export Company (Chaplin’s copyright watchdogs) and Lopert Films, Inc., a United Artists sub, claimed the Inwood horned in on a legit Modern Times engagement set for New York’s Plaza Theatre. Gauntlets having been tossed, the Inwood now applied gas to flames and scheduled The Gold Rush for a May 8 opening. Chaplin was hot at their ticket window and receipts warranted taking a chance. The International Art Company was again source for their print. Modern Times had meanwhile opened at the Plaza to sock business ($20,000 the first week and nearly as much for a second). It looked like public opinion was softening toward lightning rod Charlie, his political and State Department woes retreating back in collective memory. Modern Times was Lopert-booked into the East Side’s Victoria Theatre in addition to its Plaza stand. We want to insure the longest possible run for the film, said a company spokesman. Chaplin shorts done eons previous for Mutual, Essanay, and even Keystone were competing in revival closets all over Greenwich Village. Interest in the comedian’s latest, A King In New York, was stoked for his backlog ruling art house screens, but Charlie said nix to a US release. He’d not make the two year completed feature available stateside, even as plans kept apace toward reviving his Tramp persona. 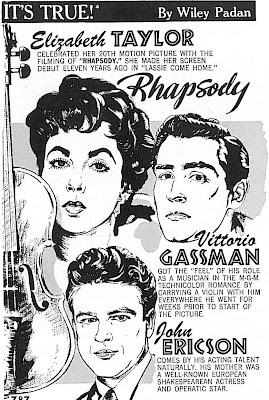 International Art meanwhile sought to widen The Gold Rush to nationwide patronage, their Boxoffice trade ad renaming the Washington firm Film Masterpieces for purpose of scoring dates. They called theirs The Original Full-Length Comedy Masterpiece, and indeed it was nearly that, for this was Chaplin’s 1925 version and one quite different from his official 1942 re-cut that had been in near-exclusive circulation over the past seventeen years. 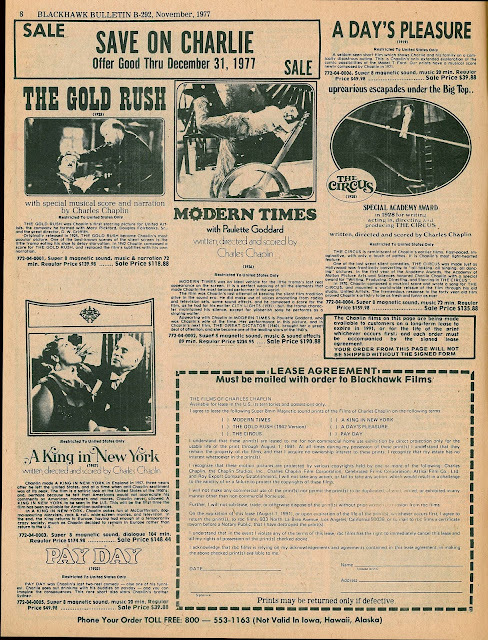 International/ Film Masterpieces’ trade ad broke the first week of June, just as Lopert was planning their own engagements of The Gold Rush to follow up on successful Modern Times. Here was further occasion to clear mats for another courtroom drag-out. 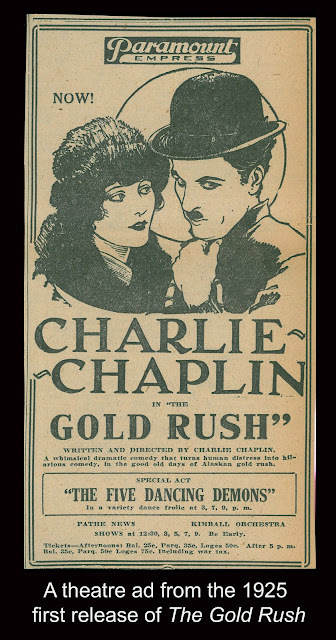 June 3 saw Lopert’s announcement of an original, uncut "The Gold Rush" to be blanketed in theatres across the country over following weeks, adding that this was the only production print of "The Gold Rush" which Chaplin has authorized for exhibition in the United States. There were also negotiations with Roy Export for a package of shorts to be called Chaplin’s Parade. They’d be newly scored and include Shoulder Arms, A Dog’s Life, and The Pilgrim, the trio having been out of theatrical circulation since the silent era. Chaplin was said to be preparing music and narration to juice these for a new audience. But what about the black eye he was getting for a bootlegged Gold Rush smelling up US theatres? Prints out of International/Film Masterpieces were available in 35mm, but paled beside Chaplin’s 1942 version, despite International’s being actually more complete than his own. 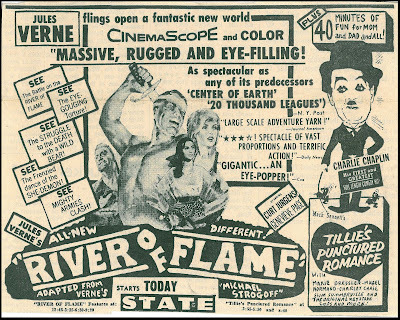 Lopert knew they’d have to vanquish these in order to click with a sanctioned Gold Rush (scheduled to begin July 22 at more than a score of metropolitan area theatres), and toward that end sought an injunction to halt further outlaw runs of the 1925 classic. This was in mid-June as International/ Film Masterpieces had a print running at the Grande Theatre in upper Manhattan. Lopert alleged unfair competition and trade practice against International /Film Masterpieces, its head of operations Robert B. Fischer, and the Grande. 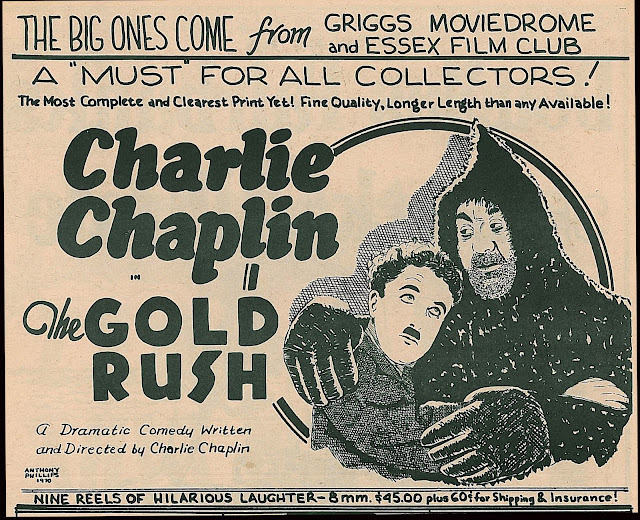 A major chink in Lopert’s armor was Chaplin having failed to renew his 1925 silent version of The Gold Rush after its initial twenty-eight year term of copyright protection, which expired in 1953. He was out of the country by that time, and US Chaplin offices were more or less dormant. 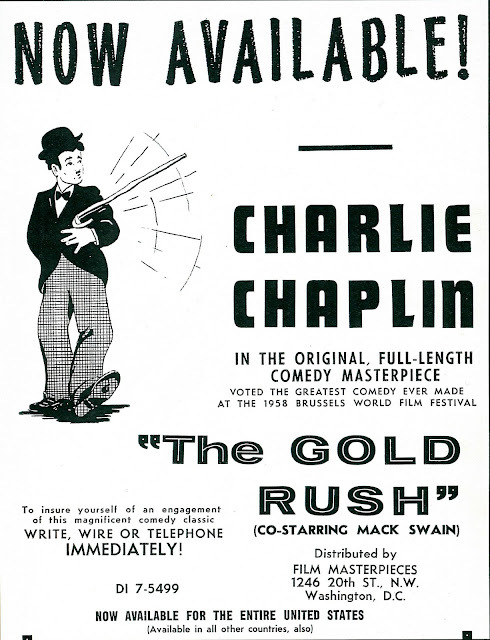 The 1942 reissue, with score and narration added then by the comedian, had been properly registered, but courts wouldn’t be persuaded that The Gold Rush in all its incarnations should be exclusive to Chaplin. 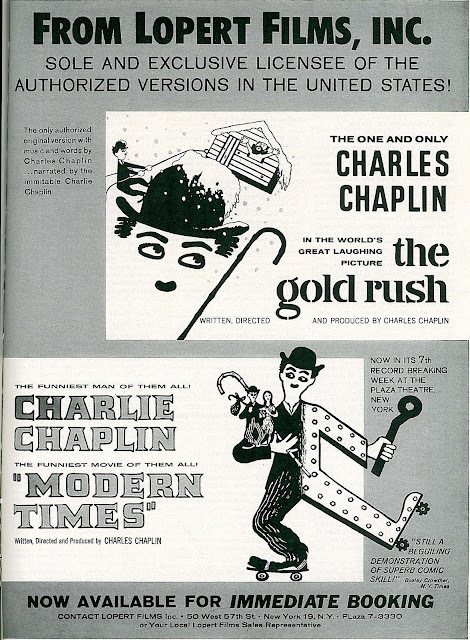 A final order enjoined Film Masterpieces and others from exhibiting Modern Times and fourteen other Chaplin films controlled by the Roy Export Company (with specific exclusion of The Gold Rush). Turned out International/ Film Masterpieces was infringing beyond Modern Times to encompass City Lights, The Great Dictator, The Kid, and others from Chaplin’s library. 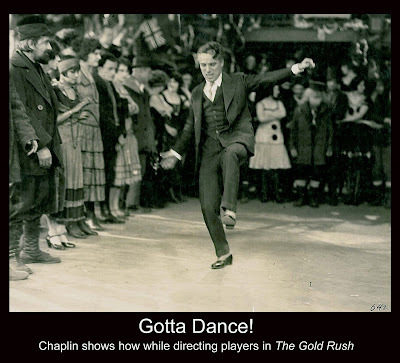 Runs and playdates in New York, Cleveland, St. Louis, Baltimore, Philadelphia, and Washington were thus shut down or cancelled, giving Chaplin/Lopert at least the appearance of emerging from the fight victorious, despite their 1925 Gold Rush being adjudged in the public domain. The Gold Rush of 1925 became the version a coming generation would know best. Any group or institution with a print could run it for free or profit. Paul Killiam found 35mm elements and made his scored rendition available. Collectors could acquire The Gold Rush from Blackhawk, Griggs-Moviedrome, or any dealer with a bathtub. Quality varied, but ones I saw looked OK. This was, after all, the only major Charlie Chaplin feature we could get on 8mm. 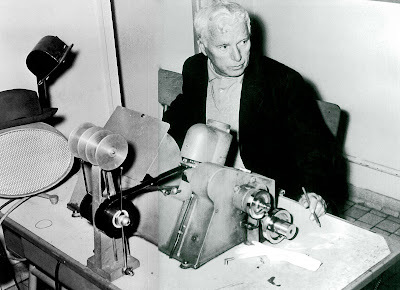 My friend Brick Davis bought those nine little reels from Jack Hardy at the old Silent Cinema Service back in 1969 and we were thrilled to finally see the legendary film for which Chaplin most wanted to be remembered. Sellers used to compete by claiming their Gold Rush to be the most complete anywhere. One I recall touted the inclusion of a rare assayer’s office scene where Charlie redeems his gold. Collectors redeemed theirs for opportunity to possess a definitive Gold Rush (as I recall, Brick’s print cost about $40). Multiple vendors were panning for whatever dust lay visible as dupes were dredged from ones that had been duped before. When Chaplin reissued his backlog to theatres in 1972, we finally had opportunity to see The Gold Rush as Chaplin reassembled it in 1942. My disappointment over that was acute. It seemed he had ruined a great show with intertitles shorn and narration spoiling the gags. I came out of Greensboro's Janus Theatre convinced that The Gold Rush was truest only in its 1925 incarnation. Chaplin out of the public domain continued doing business. 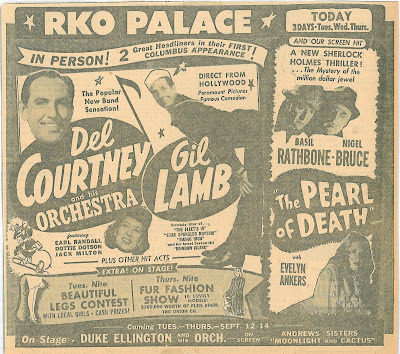 Theatres right through the sixties and some into the seventies booked various Cavalcades and Carnivals made up of shorts from the teens, while even Tillie’s Punctured Romance filled lower berths (as here) when showmen opted for old-time laffers. New 35mm prints of Tillie were tendered in 1959 by Continental Distributing as means of cashing in on Lopert’s profit-making runs, as certainly no one could claim exclusive rights in Mack Sennett’s 1914 antique. When home video later came to the fore, calls went out for a proper restoration of The Gold Rush. Kevin Brownlow and David Gill took on the project on behalf of Chaplin’s estate. Gill wrote a terrific article about complications of that for Griffithiana (#54 --- October 1995), a film journal difficult to find in back issues. One notable thing Gill mentioned was a 35mm print they had found of The Gold Rush that originated with a man called Bob Fischer, a former associate of Raymond Rohauer. That last part intrigued me as I assume this was defendant Robert B. Fischer from the 1959 lawsuit. What I had not realized was Rohauer’s behind-the-scenes involvement with International/ Film Masterpieces. Turns out Rohauer acquired his source material for the 1925 Gold Rush when he, according to David Gill, bought up all the film Chaplin slated for destruction after he was prevented from returning to the states in 1952. Rohauer claimed to have assembled his Gold Rush from outtakes Chaplin discarded, adding that this was basis for prints he distributed into the sixties. As to present ownership status of The Gold Rush, there are clouds gathered as result of 1994’s passage of an expanded GATT treaty. 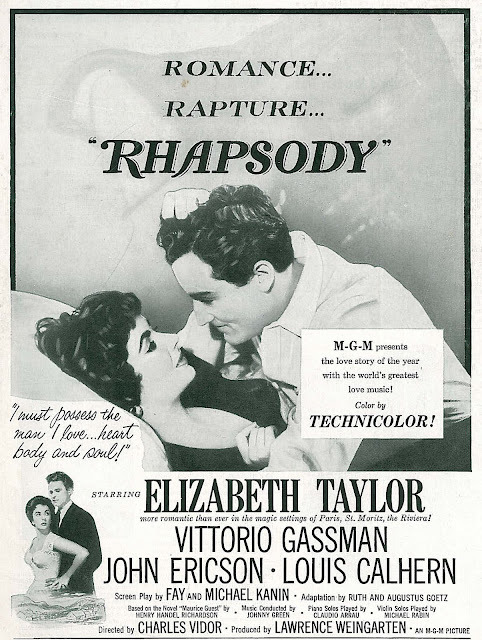 Chaplin’s estate has used that to argue renewed exclusive rights in the film. Several proposed runs of the 1925 version have been blocked after letters from counsel representing the heirs. Would it be worth anyone’s time and considerable expense to duke this out in court? 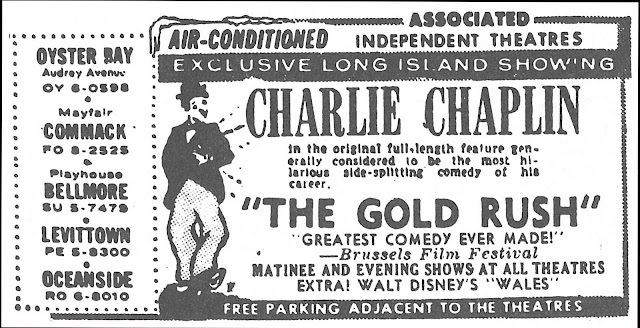 Little has changed over fifty years since Chaplin tried scuttling would-be exhibitors of The Gold Rush, other than legal issues becoming, if anything, cloudier and more unresolved. More on the 1942 reissue of The Gold Rush in Greenbriar's Archive here.